The Pr’ Gavedarjo in Podkoren, Kranjska Gora has just achieved a prestigious Green Key Certification. 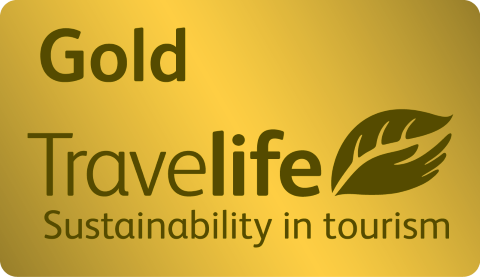 The Green Key award is the leading standard for excellence in the field of environmental responsibility and sustainable operation within the tourism industry. This prestigious eco-label represents a commitment by businesses that their premises adhere to the strict criteria set by the Foundation for Environmental Education. A Green Key stands for the promise to its guests that by opting to stay with the Green Key establishment, they are helping to make a difference on an environmental level. The high environmental standards expected of these establishments are maintained through rigorous documentation and frequent audits. At Pr’ Gavedarjo Design Rooms we are all conscious that the action of each and every one of us has the impact on the environment, so we operate to high standards of performance and advocate socially and environmentally sustainable business practices. Our aim is to bring a positive benefit to the societies in which we operate through high quality services, economic growth, environmental protection, community involvement and employment. In order to adhere to these principles, we endeavour to reach our set goals. This is a belief that everyone at Pr’ Gavedarjo works with, to ensure we’re doing our bit to build a sustainable future with the help of our guests and other stakeholders. At Pr’ Gavedarjo Design Rooms we are all conscious that the action of each and every one of us has the impact on the environment, so we ensure we’re doing our bit to build a sustainable future with the help of our guests and other stakeholders. We are reducing our energy use by providing heat from renewable sources and the waste heat from a nearby industry, by modern lightning control and ventilation systems and energy efficient appliances. We have reduced the amount of waste we produce by recycling and using refillable containers, buying in bulk and reducing the amount of resources used. As well as these day-to-day environmental measures, we go even further to protect the environment by providing the healthy sleeping environment with all natural materials used (waxed wooden floor, furniture made of whole wood, lime painted walls) and organic sheets, mattresses and towels, organic shampoos and soaps and recycled toilet papers and tissues. We offer our guests healthy organic and local breakfast for the good beginning of successful day. At the end we do measure our performance regularly to monitor the impact of our sustainability efforts and plan improvements accordingly. At Pr’ Gavedarjo design Rooms we also try to involve our guests in our sustainability activities, such as encouraging guests to recycle and save energy whilst they are staying in the hotel, running a towel and linen re-use service to help save water and informing our guests about protected areas in the destination. One of the key reasons for Pr’ Gavedarjo to care about sustainability is to help protect the unique natural and cultural characteristics of our resort, so it continues to attract tourists in the future. The Pr’ Gavedarjo therefore serves local food, provides information on local customs, heritage sites/places of cultural interest, restaurants, or places to buy locally-made goods or souvenirs.